Copyright Photo: Ton Jochems. 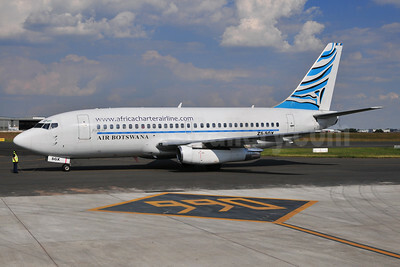 Boeing 737-2T5 ZS-SGX (msn 22396) is pictured at Johannesburg. This entry was posted in Air Botswana and tagged 22396, 737, 737200, 7372T5, Africa Charter Services, Air Botswana, aviation, Boeing, Boeing 737, Boeing 737200, gaborone, JNB, Johannesburg, lanseria, transportation, victoria falls, ZSSGX on October 11, 2012 by Bruce Drum.